Commercial builders and contractors are an integral part of a region’s economy. Thanks to their work, many other people find jobs-some due to being employed as part of the construction process and others after the location is completed. Recently, Page Progressive has joined website building with brick and mortar construction. 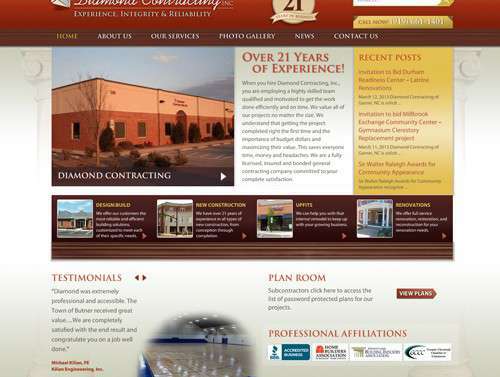 Rather than wielding cranes, hammers and skill saws, we employed graphic designers, marketing and web knowledge to build a website for Diamond Contracting, Inc. Since 1991, Diamond Contracting, Inc. has been specializing in commercial contracting. They are known for being a highly skilled team, led by Mike Swanson, Andy Ward and Bryan Wolfe, that understands the value of bringing strong work ethics to each job. This dedication to detail and to their clients is reflected when one sees the finished building or up-fit. As commercial contractors, they are able to design, build, renovate or up-fit a retail location, warehouse, sales center or sports facility to meet your needs. Not sure what changes are actually needed at your location? No problem! Diamond Contracting, Inc. offers site analysis, value engineering and building system integration.